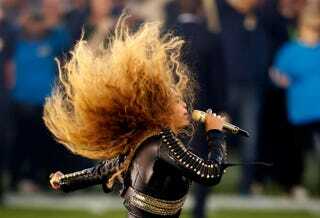 Beyoncé performs during halftime at Levi’s Stadium on Feb. 7, 2016, in Santa Clara, Calif.
Usually, off-duty police officers sign up to work concerts in droves because the overtime is extra cash in their pockets, but according to Fox 13 News, not one Tampa, Fla., police officer has signed up so far to provide security for Beyoncé's concert there April 29. A spokesman for the Tampa Police Department says that he doesn't know yet if officers are thumbing their noses at Beyoncé because of her Super Bowl performance, which some found to be anti-police. Either way, the department is committed to providing security for her event. "We're going to staff it because we have a responsibility to do that regardless of how controversial it might be, who the artist might be or the politician might be," Police Department spokesman Steve Hegarty said. "This is a couple of months away, so we've still got plenty of time to fill those slots."